Blisters seem inevitable: the farther you hike, the higher your odds. Once they get going, they don’t go away and they generally get worse. So, the best thing to do about a blister is make sure you never get one. Duct tape: If you know you’re hiking many, many miles, try putting some duct tape on your trouble spots. The smooth outer surface is a natural friction fighter, and the tape provides a foot-protecting barrier. Bar of soap: Rub some bar soap like Ivory inside your boots just before you start. Don’t get carried away or your foot sweat will turn your shoes into lather factories. Trim your toenails: My nastiest blisters happen when a sharp edge of my pinkie toenail digs into the toe next door. Once it starts, it can be a full-blown pain in a half-hour. Liner socks: Heavy duty hiking socks, especially the wool ones, are rough on your feet. Liner socks reduce that roughness, though they do increase the heat, so make sure you really need them before adding the extra layer. So, you get the idea: anything that reduces friction should help keep blisters at bay (except your favorite water-soluble hanky-panky lubricants; foot sweat will dissolve them). That’s only half the game, though, because friction isn’t the only thing that heats up your feet. Get the right shoes: Unless you’re carrying a 30-pound-plus load and/or have weak ankles, you really don’t need heavy-duty hiking boots. Also: you may not need GoreTex or E-vent or any of the other so-called waterproof fabrics — all are notorious heat-trappers — unless you encounter a lot of wetness on the trail. Light, good-fitting shoes with ample ventilation go a long way toward preventing blisters. Get the right socks: You want fabrics that wick moisture away from your feet in hot weather and still insulate in the cold. Cotton is the worst because once it gets wet, it stays wet, and it loses its insulation power. I’m a big fan of synthetics, but there are wool socks these days that work just as well without all the scratchiness of old-fashioned wool socks. 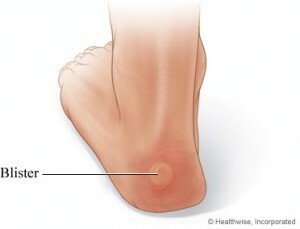 Get grit out of your shoes now: The tiniest burr, pebble or bit of grit can rub through your skin in minutes — especially in areas like the back of your heel where the skin is not as tough (happened to me just last week). As soon as you feel something in there, stop and get it out. The longer you wait now, the more you suffer later. Keep grit out of your shoes: Gaiters are like condoms, except they prevent blisters instead of babies. Gaiters also trap heat, so they’re not a cure-all. Often hiking in long pants will offer almost as much protection, but if you hike with naked legs, you’ll find yourself wishing you had gaiters. Rest and rub: On an all-day hike, I try to stop about half-way, take off my shoes and give my feet a good massage. Just taking off the socks and airing things out cuts heat considerably. Outside the heat-and-friction category, the best thing you can do is reduce the load on your feet. I’ve gotten more blisters on overnight backpacking outings than on all my day hikes combined. If you’ll be on the trail several days hauling all your camping gear, prevention is all the more important because you don’t want to be backpacking on feet that are killing you. You can do all this and still get blisters: Go here for blister treatment tips. Subscribe to comments with RSS or TrackBack to 'Blister prevention: once you’ve got one, it’s too late'. Gaiters are like condoms, except they prevent blisters instead of babies. I could have used some scree gaiters on this hike. Having the right footwear is critical of course, but even the best pair of hiking boots will become worn inside and a little looser .. leading to blisters from heel-lift. A trick I carried over from heel-lift problems in snowboarding is to insert filler (duct tape, ripped ski-map etc) under the arch of my foot. It creates a pivot-point that reduces the amount of movement in the heel. The best stuff to use for blister prevention is from 2 toms (2toms.com). The powdered blister shield is so great. My husband and I used it on hike to the bottom of the Grand Canyon and back. No blisters for either of us! The powder is like little ball-bearings and they don’t absorb moisture so your feet stay dry. My best blister prevention is water!! Staying hydrated. Your skin won’t be so tight and prone to blisters if you are well hydrated. So drink up!! hmmm for me the best is actually antiperspirant. Which absorbs the extra moisture and provides some slickness. Amazing what it can do it the right places. I started getting blisters on the inside of my ankle last year in a place I’d never had them before. It was the seam of my shoe (same brand, same size, I’d worn previously, but anyway…). I put blister pads on my foot, but I also took some moleskin (duct tape might work) and put a couple of layers over the seam of the shoe. It worked like a charm for hundreds of miles after! I’ve officially sworn off hiking boots. I put hundreds of miles into my last pair and they NEVER broke in or stop tearing up my heels, even with prophylactic moleskin, liner socks, or whatever. I have this problem with every pair of hiking boots. Instead, I end up wearing in my trail running shoes or cross trainers, hiking the last two days of backpacking trips carrying the darn boots around with me, gingerly hobbling with bad blisters and hoping they don’t get infected. An infected blister landed me in the ER with cellulitis and a fever once; it is no joke. I also sprained my ankle in hiking boots once, so I don’t buy the whole protective argument. For me, the best way to avoid blisters is to reserve hiking boots for snow and slush. I used duct tape for the longest time but it always rolled up and peeled of my feet. I use Tape Relief now (http://www.taperelief.com/). It goes on like a lotion and dries into a barrier on the skin. No more friction blisters!